Last month I mixed business with pleasure during a week in Vancouver, discovering a plethora of great fashion spots in the process. Eco-fashionista Nicole Bridger just opened her new flagship store (2151 West 4th Avenue) in Kitsilano. Staying true to her environmentally conscious roots, the shops boasts green design (think elegantly reclaimed, recycled) by Vancouver’s New Leaf Interiors. If you’re a Nicole Bridger fan don’t miss her photo contest by submitting a photo wearing your favorite Nicole Bridger Design and why you love it by July 31st. The best picture and answer (creativity and originality rule) will win a $100 NBD gift certificate. Malene Grotrian welcomed me into her studio for a tour of her latest collection and a glass of bubbly. The super friendly designer, originally from Denmark, is quite effervescent herself. But it’s clearly her expert knack for draping and fit that keep her clients coming back. Bring your girlfriends to Malene’s studio for one of her upcoming Style Soirees or hit her upcoming Open Studio on July 24th (Suite 910 – 207 West Hastings Street, in The Dominion Building) from 10am – 3pm. Two retail shops worth checking out: The Velvet Room Boutique (2248 West 41st Avenue) which exclusively supports Canadian designers like LOVAS, Sarah Stevenson and Karamea. They have a wide selection of apparel, accessories and leather goods. And you don’t have to be in Vancouver to enjoy Charlie and Lee (223 Union Street). Luckily, for those of us who are geographically challenged, they sell online. I’m currently coveting accessories by Moon Raven and shoes by Jeffrey Campbell. With fashion week barely behind us, Toronto’s fashion crowds hit the Design Exchange for TFI’s New Labels runway show. Over five months, selected designers work independently and with a team of judges to create a collection. 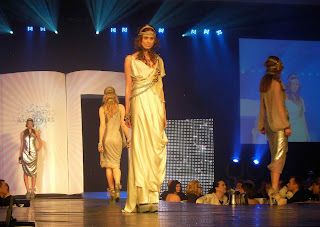 Three finalists shared the runway: Caitlin Power, Golnaz Ashtiani and Nikki Wirthensohn for NARCES. Afterwards, the judges picked a winner based on a line’s fit, quality, innovation, marketability and styling. I’m a fan of Caitlin Power – having noticed her at Edmonton Fashion Week years ago – and would wear NARCES cocktail dresses in a heartbeat, but Ashtiani’s line was a clear front-runner and took the crown. Her grand prize is valued over $40,000 and includes a Flare magazine feature and the chance to design an outfit for Sears womenswear. Interestingly, one of the judges, Sears Canada’s brand and trend director, Cynthia Florek, is a previous finalist of TFI New Labels competition for her now defunct label CINCYN. Other previous New Labels finalists and winners include David Dixon, Joeffer Caoc and Ashley Rowe. Unfortunately, there are too many who are no longer designing at all, proving you can have the talent but fashion is still about the business. Those of us who work in and follow fashion must do a better job of helping designers sustain their labels. In the meantime, I wonder if they are working on a TFI New Labels “where are they now” special. Here’s (hint, hint) hoping. Valentine’s Day gets a tough rap, with many declaring it a “commercial holiday.” Yes, to a large degree it’s true. We are inundated with so much tacky, heart-shaped stuff the day has lost any connection to true, undying love or St. Valentine, the patron saint of lovers. At Style & Conscience, a locally produced and socially responsible clothing line run by Montréal Couture, Valentine’s Day is about a different kind of heart. Last week Style & Conscience presented an exclusive accessory collaboration with Denis Gagnon that benefits the Heart and Stroke Foundation of Québec. Gagnon has designed the “I Love U” mini-collection that includes a signature leather handbag (named Stéphanie), a silk scarf (named Alexandra) and a keychain (Amélie). Each item was named after 8-year-old triplets of Dr. Nicolas Noisieux, an important volunteer for the Foundation. Sold separately or as a trio, the production is locally manufactured on demand only, with 20% of the sales going to finance Heart and Stroke Foundation’s research projects. And that is something we can totally love. For any shoe lover, the idea of not having shoes is unimaginable. But the notion that not having shoes could lead to death is purely unthinkable. 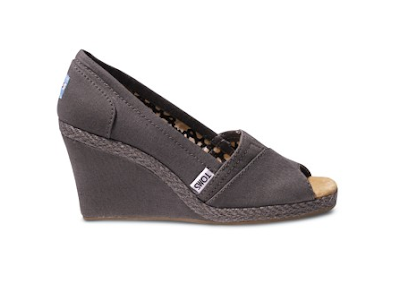 All hail TOMS Shoes. This charitable organization has created a movement to outfit children in developing countries with shoes by way of every sale it makes. One for one. According to TOMS website, a leading cause of disease in developing countries is soil-transmitted diseases, which can penetrate the skin through bare feet. Wearing shoes can help prevent these diseases, and the long-term physical and cognitive harm they cause. Many times children can’t attend school barefoot because shoes are a required part of their uniform. If they don’t have shoes, they don’t go to school. If they don’t receive an education, they don’t have the opportunity to realize their potential. Do you need any more reason?! For a designer to resonate with a public, they need to have a voice. That may be an odd choice of words given a designer’s silent contribution in the form of fabric, but the voice is what the customer either relates to – or doesn’t – as it must also speak for them. 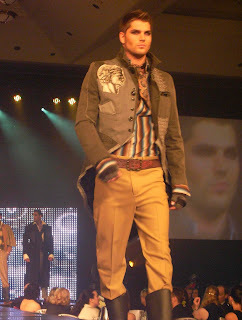 Evan Biddell‘s voice has been loud and clear since he first showcased his winning Project Runway collection. And each season that voice seems to get stronger. It’s a voice says, “I’m feminine and soft, but don’t f#%k with me, I can’t be played. “For spring, the ever-daring Biddell combined the hard edge of armour with the wispy float of a summer breeze and made it work. Biddell is, in fact, all business now. He has spent the last five months working out of Seven Continents, a local manufacturing company steeped in design. 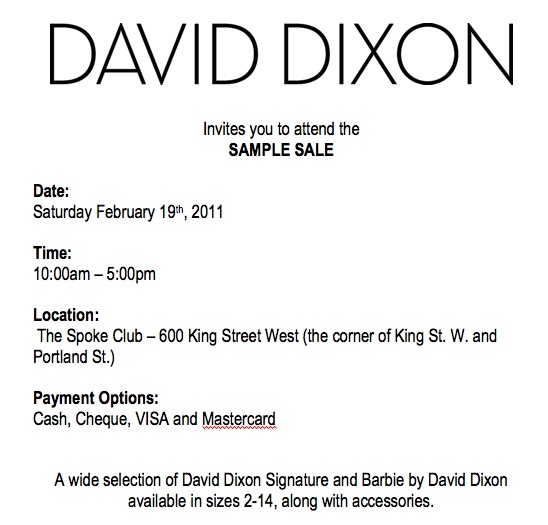 They produce mannequins, bust forms and pretty much any display or merchandising item used in retail, from Joe Fresh to Abercrombie and Fitch. They clearly appreciate all facets of design and innovation. It’s a Warhol-ian Factory circa 2010. In fact the runway show took place inside the factory where endless mannequins towered above at the guests on massive shelves. What I appreciate about his work is that he can continually surprise us with new shapes, textures, cuts and detailing but still keep it – for the most part – quite wearable. His is not a collection you will likely ever find at The Bay, but when you do stumble upon a piece by Evan Biddell, you will be know immediately you have discovered something special. Evan Biddell autographed TWO limited edition shopping totes by Aldo for YOU, F-listers! I’ll pick two winners at the end of the weekend – contest closes at 8pm on Sunday, October 17th. 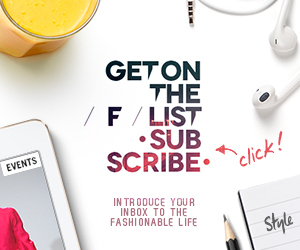 One entry per person. The bag is a symbol of the donation Aldo has made on behalf of the Canadian fashion industry and Evan in the fight against AIDS. You will be proud to carry it! Catch Evan’s show at LG Fashion Week – Thursday, October 21 at 6:30pm. When it comes to fashion choices, women have men beaten in spades. We have endless options and each season the trend gods pile on more to satisfy our fashion whims. It’s no wonder that fashionable boys are eager to diversify their wardrobe too. Late in August I popped into a bright studio where piles of Aldo shoes and Peroni beer surrounded the tiny workspace of designers Stephen Wong and Kirk Pickersgill. 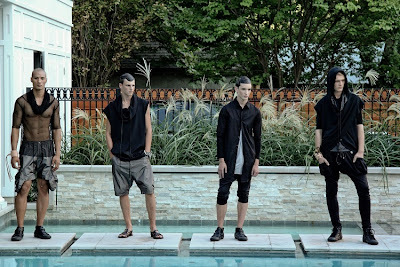 The goodies are left over from Ezra Constantine’s official poolside launch the week before at a gorgeous Toronto mansion. Any fashion lover with a pulse in Canada could not have missed the ascent of Stephen and Kirk’s luxurious womenswear line, Greta Constantine. Greta was an instant hit with socialites and celebrities. But if you think Ezra Constantine is Greta’s new baby brother, think again. That style is what drives Ezra Constantine. 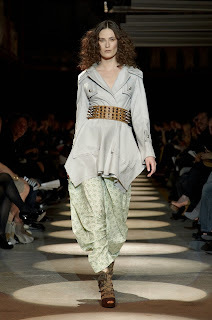 Since its quiet debut in October 2009 the line has appeared in small doses at Greta Constantine runway shows. Leathered, beat up and battered male models often exemplified a hard, bad boy attitude. It’s a look for the fearless man, but that dark avenger look is mostly runway styling. Upon closer inspection, Ezra Constantine, the collection, is an elegant mix of functional details – a detachable hood here or cargo belt there – combined with fabrics like twill, French fleece, coated linen and mesh. In their capable hands a button down shirt is no longer just a button down shirt. Womenswear is about cut. Menswear is about details. I’ve got a lot on the go right now so, admittedly, I didn’t give much thought before heading over to Holt Renfrew for Donna Karan’s personal appearance. To be clear we are talking the DK of DKNY. I was recently reminded of Karan’s iconic stature in Flare‘s September issue, that it’s been 25 years since she launched her 7 Easy Pieces collection during her reign at Anne Klein. Since then Karan’s designs have become synonymous with ease and versatility. She even brought us the first diffusion line when she launched DKNY, a less expensive line for the younger shopper. Aside from being an incomparable designer for the modern woman, one whose work I always loved, I knew she is a yoga afficionado and a philanthropist supporting AIDS and cancer charities. I’ve always appreciated the upbeat, no-fuss approach she appears to have in life. The CFDA has honoured her an astonishing seven times. And lately this queen of American fashion is sharing more of her spiritual side and influence through her Urban Zen Foundation. Even knowing all that, I thought I’d just pop over to Holt’s with a pal for a quick photo opp of Donna hanging with her latest collection and that’s it. But there is something so…compelling…about this woman’s presence. Within minutes of being in the same room I knew that I had to introduce myself. “Thank you.” Her eyes lock on mine and her smile is infectious. “Thank you so much. Are you a designer?” she asks, still smiling. “The what?” I realize I have a fleeting moment here. I quickly pull a F-list promo card from my purse and hand it to her. We chat a bit more about designers and fashion weeks (she thinks mid-October is “NOT too late!” for ours), have a quick photo together and then she’s devoured by another fan, hungry for some DK conversation. 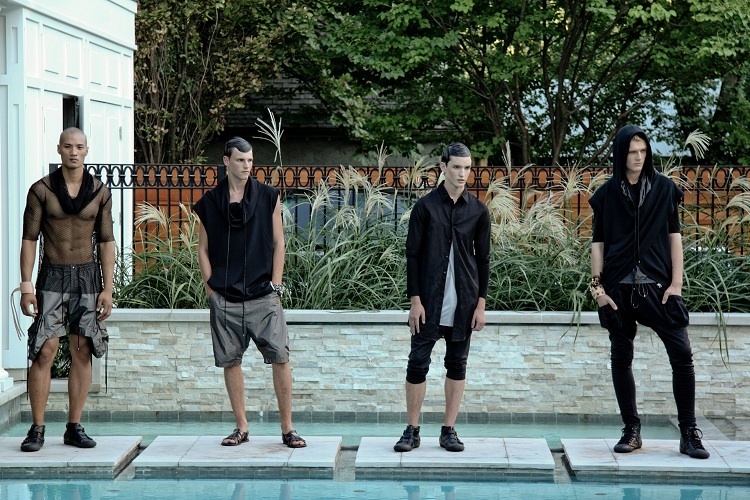 Denis Gagnon – (right) a minimalist from Montreal with a tendency for the monochromatic. He’s also absolutely brilliant and far too special to keep to ourselves here in Canada. Jeremy Laing – this serious, young lad apprenticed with Alexander McQueen and often draws from the Canadian landscape for inspiration. His work shows signs of Japanese influence yet somehow he maintains an organic, natural quality. Pink Tartan – designer Kimberley Newport-Mimran reminds me a bit of Donna in that everything under the label speaks precisely to what Kim herself will wear. Her collections are for the practical woman who knows how to balance girlish charm with a clean, modern edge. Greta Constantine – (left) Stephen Wong and Kirk Pickersgill may be known as the “jersey boys” for their expertise with the fabric, but their talent in creating edgy, feminine designs with all sorts of textiles is well-known. Dare we forget their seat belt couture? 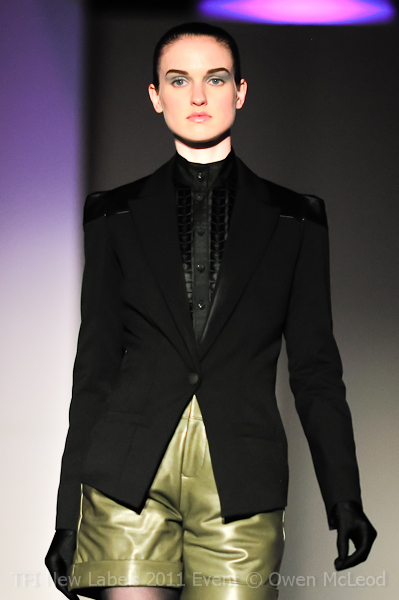 Rad Hourani – think urban warrior when considering Rad’s work. He calls it asexual, aseasonal and anti-conformist. I just call it awesome. Joeffer Caoc – one of the first designers I discovered after moving to Canada and one of the nicest people on the planet. Joeffer’s work is intricate yet subtle, classic yet unconventional and built for the sensible, modern woman. Thieves – Sonja den Elzen’s fledgling line brings sustainability and style together for good. Through uncomplicated (but expert) draping and detailing she works wonders with eco-fabrics for both men and women. Dear readers, I encourage you to check out the article on Donna in last month’s Town & Country magazine. You can download it at Urban Zen Foundation website. It’s an unbelievable insight into her world and the power that one individual has to motivate a movement. Is that a Bookmark in Your Pocket? Toronto Public Library Foundation hosted its fifth annual Book Lover’s Ball Thursday night at the Fairmont Royal York, complete with gala dinner, silent auction and a fashion show. Eight Canadian designers sent creative interpretations from their Spring collections inspired by popular fiction works like Twilight and Sherlock Holmes. The literary crowd lost its vocabulary when the Northbound Leather boys hit the runway, resorting to hoots and hollers. And who could blame them? Half naked men tend to put the “fun” back in fundraiser. It’s no wonder this is one of the best events of the season.